Mr. Helmut Lotti (www.helmutlotti.be) is a Flemish Belgian superstar tenor singer and a songwriter who performs in several styles and languages. Mr. Lotti graciously accepted HONORARY PRESIDENCY OF THE NAMUR CONFERENCE “Your Voice in Balance: Posture Training for the Singing and the Acting Voice: Methods, Goals & Results” August 23, 2012 – 07:17 AM to August 25, 2012 – 08:17 AM The organizing body of this premiere event thanks you Mr. Lotti for your commitment to voice care and for accepting this invitation. Mgr. Magdalena Golawska, a Voice Emission Lecturer and Coach from Collegium Civitas, Warsaw, Poland Mgr. 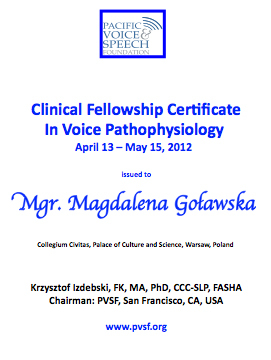 Magdalena Golawska, a Voice Emission Lecturer and Coach from Collegium Civitas, Warsaw, Poland was the second Visiting Fellow, hosted by PVSF this year (April 12 – May 15, 2012). During her stay, she observed voice pathology related clinical activity at SF ENT in SF, CA, at Kaiser ENT in Oakland, CA, and at Bay Area Laser Center located in the city of Pinole, CA, also in the East Bay. She also audited a course on voice, speech and swallowing evaluations in injured workers, organized by the California Applicant Attorneys Association. We all enjoyed her short but productive stay with us as a PVSF fellow. We are looking forward to your implementation of these new professional skills and acquired knowledge into your practice in Poland. And you are welcomed back, of course. Mrs. Lora Barbeau, Soprano, SF, CA, USA Mrs. Barbeau a graduate in Voice from SFCM is the third PVSF visitor. Mrs. Barbeau will spend up to four clinic days with PVSF in May-June 2012. The purpose is to observe clinical evaluation of different voice pathology cases, and specifically those that represent professional voice problems. given to Daryush D. Metha, Ph.D.